ManagerLabs Blog Named as Top 50 Resource! ManagerLabs is pleased to announce their blog, being named one of the Top 50 Resources for Asset Management. This is a proud moment for us here and we thank Mintek Mobile Data Solutions for recognizing the contributions the ManagerLabs team and blog are providing to the industry. ManagerLabs was formed with the sole purpose of advancing the property and facility management industry in its evolution to utilizing technology in its business processes and customer service models. With the property and facility management industry being so labor intensive, technology is a definite winner in the fight to reduce overhead and provide improved service delivery to all of its customers, vendors, occupants and professional colleagues. 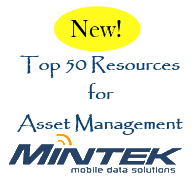 A huge thanks to Mintek for recognizing this Top 50 Resource list. We are grateful for this esteemed recognition in the industry. To our readers, please have a wonderful 2011 New Year and thanks for your continued support in reading our blog and contributing feedback on this ever-changing topic.